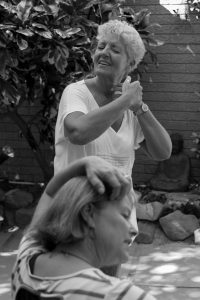 Sue in a one on one coaching session on the use of gesture. Sue has been coaching storytellers for over 20 years now. She collaborates in devising new personal storytelling material for performance, coaches on technical skills and helps develop audience rapport. People say she has a direct yet warm style which achieves results quickly and builds confidence. As the ability to tell stories is intimately linked to personal development, her coaching often leads to greater personal awareness and growth. Sue has been working in the field of organisational storytelling since 1996 when, with 2 colleagues, she formed the very first UK consultancy in this area, the ground breaking Storytelling in Organisations. Her clients include PricewaterhouseCoopers, Action for Children, Shell, BP, Her Majesty’s Revenue and Customs, the United Nations, Barclays Bank, DLA Piper, The Prince’s Trust and the National Health Service amongst others. She has contributed to programmes at Oxford Said Business School and the University of the Witersraand in South Africa, as well as anthologies such as Storytelling for Entrepeneurs by Melissa Addey (2016). Sue coaches top business leaders in narrative skills in one-on one sessions for key presentations and also works with Boards at a strategic level. Sue works collaboratively with storytellers in person to devise new material for true life storytelling performances. Sue offers 75 minute sessions of mentoring and coaching, either face to face or on Skype. 3 sessions is the minimum booking. Cost: These vary according to what is needed and where in the world you are, so please contact Sue direct on biographicalstorytelling@gmail.com Sue offers a discounted rate for students she has previously taught and also for long term projects in both business and the arts. © 2019 Sue Hollingsworth. All Rights Reserved.